Painting is a form of art that uses canvas as their medium of expression. There are a lot of types of painting but among those many, oil painting stands on top. The long lasting properties of oil paints and the mixture of different shades of color are what appeal most to novice and professional painters. If you want to try oil painting, here are some steps or basic techniques you need to take in order to produce a wonderful oil painting. First, you need to have enough knowledge about oil painting techniques. Before starting the actual painting process, you should research and read some articles in the internet regarding oil painting before trying out different types of oil painting methods. Second, caress stroking is advisable to be used when painting. It will make your painting have a beautiful texture. You should position the brush flatly onto the canvas. You can even modify the under paint color using this technique. Like the wind, you should be light in order to avoid your surroundings being damaged. Third step, you should use acrylic paint for the first layer when you start as it will dry faster. Once it dries, you can then apply more paint over acrylic. Fourth, same with photography, painting also needs a good amount of light, so ensure that the room you are positioned in has sufficient lighting. A good lighting will bring out the color of the painting magnificently. If you are painting outdoors, place your canvas in the natural sunlight so that your paint can dry quicker. Fifth, you should assure that the area where you are painting should have good ventilation. If you are using oil painting cleaners in your room or studio, you should ensure that the place has good ventilation in order to avoid inhaling chemicals as they can be toxic. If finding good ventilation spot is not possible, the option of diluting the paint with special water miscible paint is inevitable in order to avoid these solvents produce a toxic reaction. Sixth, the color of the canvas should also be considered. 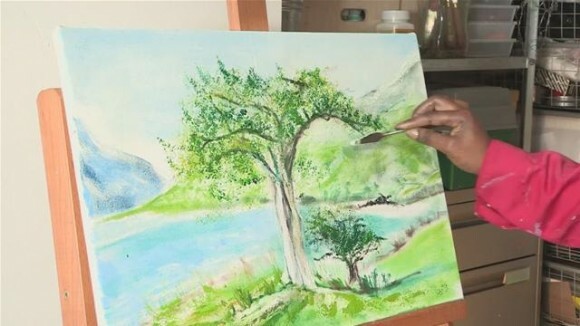 It is indeed natural to use white colored canvas, however, that seems to be inappropriate since white can be too bright which could make painting a little difficult. It can also impair your judging values in your oil painting. So it is best to use warmer colors like red or brown or yellow which can add richness to the painting. Seventh, when holding the brush, you should hold it at the top. A good artist never holds the brush like a pen. Your fingers should not be close to the bristles of the brush. Eight, you shouldn’t extremely tire yourself from finishing your artwork. Try to have a breather sometimes. If you force to work at times you are uninspired, you will just end up painting something not good in your judgment. Finally, cleanliness is very important. You should always keep your oil painting reproductions room clean and tidy. An organized painting environment will affect your thinking in a positive way. You will need a supply of towels and cleaning materials to keep your brushes clean. ← Spring Cleaning: How Often Carpet Cleaning Should be and How Much is the Cost?